Is brokering moves illegal? If you’re a moving broker, have ever considered becoming a broker or your moving company works with brokers there are some important facts that you need to be aware of. Although brokering moves itself is not illegal, there are many actions of the broker that can be illegal. As a moving broker or a carrier who works with brokers, it’s crucial to understand the details of these laws. In the book: Interstate Moving – Consumer Protection and Legal Compliance Guide, moving industry attorney Michael Garcia writes about all laws and regulations for interstate moving companies. In the book, he also outlines all of the laws and regulations that apply to moving brokers and the carriers that work with them. Along with owning and running moving companies, I also owned an interstate moving broker company for four years. In that time I experienced first hand the challenges that brokers face. I almost went to prison for running my moving broker business, it’s not a joke. I wanted to share with you some important points to understand about the laws governing moving brokers. I don’t want to see what happened to me, happen to anyone else. As the customer’s agent, Interstate brokers have a legal duty to their customers to act in good faith and issue honest and accurate estimates. Failing to clearly describe and represent their services as an interstate broker – If you are a moving broker OR if you work with a moving broker, you must make sure that the customer is 100% clear that you are a moving broker that’s booking their move and not the carrier. Failing to obtain an interstate license prior to conducting business – This goes without saying, you need to have a broker of household goods license with the FMCSA before you book any moves and broker them to carriers. Failing to secure and file a $75,000 surety bond with the FMCSA – In or order to get a broker license you must have a $75k surety bond. 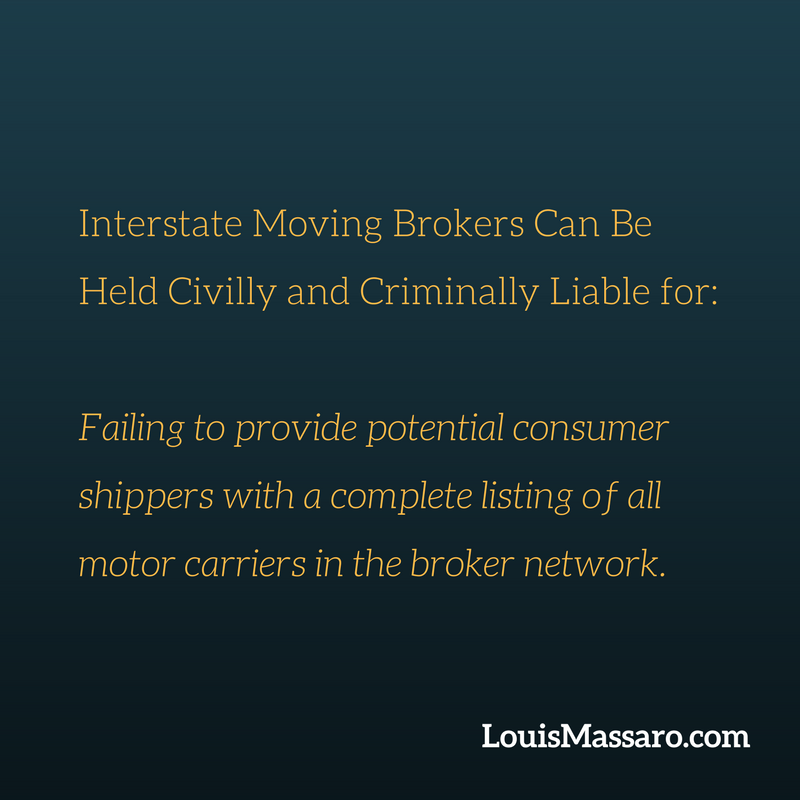 Brokering a shipment to an unlicensed motor carrier – As a broker, it is your responsibility to make sure that the carrier is licensed. That means at the time of the shipment, not only when they sign up with your company. They could have been licensed when they signed up with you but lost their license along the way. It’s your responsibility to monitor their license to make sure it’s active. Failing to provide potential consumer shippers with a complete listing of all motor carriers in the broker network – You must provide a list of every single company (carrier) that is in your network to every potential customer that you give an estimate too. Failing to provide shippers with the booklet “Rights and Responsibilities when you Move” – You can provide this electronically as a PDF but you must provide it to every customer that is moving interstate. Failing to provide a written estimate for services based upon the motor carrier’s published tariff – When you book a move as a broker, you MUST book each move using the tariff of the company that will be hauling that shipment. If you are the carrier and the broker is not using your tariff to book your moves, you will be held responsible too. Failing to maintain a “master list” of brokered transactions – You must maintain a list of all of your transactions, including financial transactions with carriers. Failing to have a properly signed “409” agreement with each licensed motor carrier in the network – A 409 agreement is the contract between the broker and the carrier. Failing the provide consumer shippers with a written notice of deposit, refund, and cancellation policies – Your estimates should clearly state the use of any deposit and what the refund and cancellation policies are. Conducting business evidencing a pattern of fraudulent estimates – “lowballing” – It does not matter who is to blame. If the customer receives one price and that price is raised by the carrier, that will be looked at as a low ball estimate. So as a broker, make sure your estimates are accurate and that your carriers are not increasing it. As a carrier, make sure that your broker is providing accurate estimates for your moves. I would suggest that you pick up a copy of attorney Michael Garcia’s Book Interstate Moving Consumer Protection and Legal Compliance Guide and read it. Have everyone involved in your interstate operations read it. 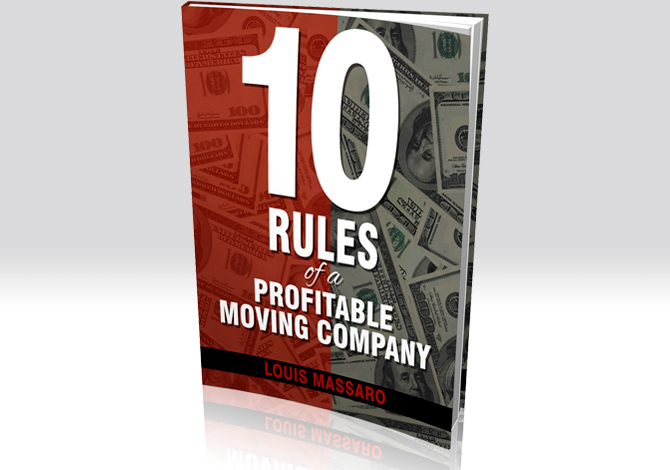 This book is about ALL interstate moving laws not just for brokers but for carriers too. So is brokering moves illegal? It depends if you are following the law. If you are a broker OR if you are a carrier that works with brokers, MAKE SURE YOU KNOW THE LAW! 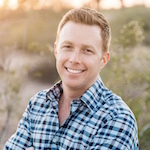 Hey my friend is Louis Massaro, CEO of Moving Mastery and founder of Moving Sales Academy. Is brokering moves illegal? I’ve been getting this question a lot lately, so I wanted to address it. Those of you who’ve watched my previous video on how I almost went to prison for running my moving company, I really got into how I was in the moving business, had offices throughout the country, then I had long distance trucks running all around the country and I decided to sell the long distance trucks, get into brokering. Long story short, I ended up pleading guilty to felony charges, based on running a brokerage business. So the question becomes, is brokering illegal? If you don’t know the story, I’m not gonna get into it in this video, you can go ahead and check for the video that says, “How I almost went to prison for running my moving business.” I go through the whole story in there, today I wanna address is brokering moves illegal? And the answer to that question is no, brokering moves in and of itself is not illegal, but what I wanna do is break down some things that you need to be looking at and you need to be concerned about, if you’re gonna be a broker and if you’re gonna work with brokers. So, what I wanted to do is, I brought with me a book from Michael Garcia. Michael Garcia is the moving industry’s leading interstate moving attorney. He actually wrote this book, Interstate Moving Consumer Protection and Legal Compliance Guide. Michael’s a great guy, he knows what he’s talking about and I wanted to read you something out of his book. Not only to think about the brokering situation and my story and what happened to me, and let that be kind of a decision factor for you on whether you wanna be a broker or continue to be a broker or whether you wanna work with a broker. I wanna read you some stuff right out of this book, so that you can understand where you’re at, where do you stand if you’re gonna broker moves. So, let me read this to you, it says, as the consumer shippers agent, so as a broker, you’re actually an agent for the shipper, the customer, the person that’s moving interstate, all right? You’re the one that’s gonna go out and find the mover for them, you’re their agent, okay? 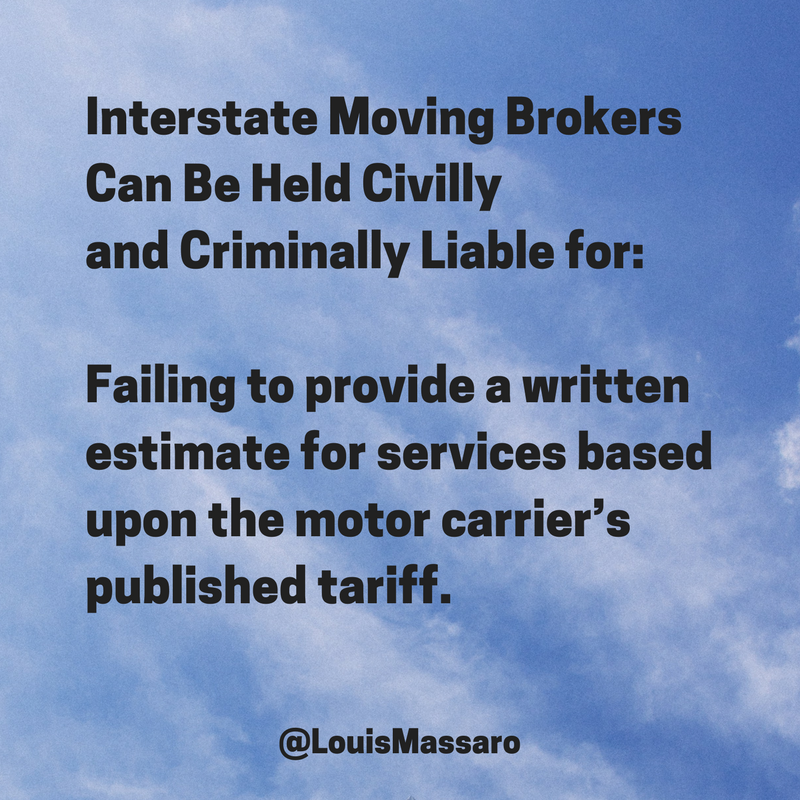 Interstate brokers have a legal duty to consumer shippers to act in good faith and issue honest and accurate estimates. 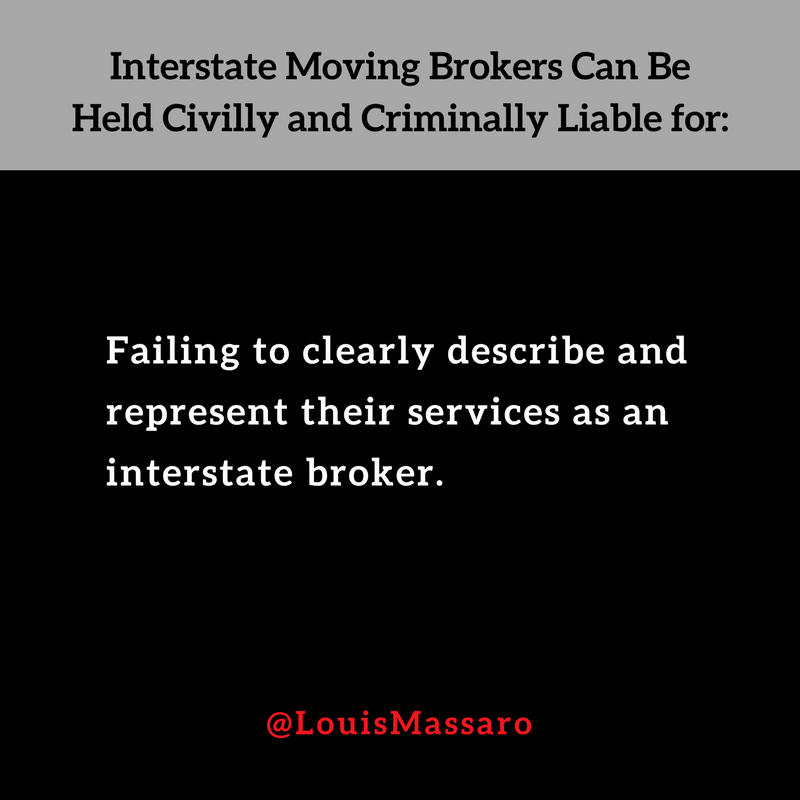 Interstate brokers can and are held civilly and criminally liable for the following. Number one, failing to clearly describe and represent their services as an interstate broker, okay. This was part of what caused me to get in trouble. When we first became a broker, we were also a moving company. I also had locations throughout the country, local moving companies, so my website had pictures of trucks all over, real trucks that we owned, talked about us doing moves because we did, but our interstate page talked about us being a broker, but that wasn’t enough. ‘Cause consumers were confused because when they went to the site they saw that we had trucks, they saw that we talked about being movers, they even saw pictures of our movers, and that’s part of the reason that I ended up getting in trouble for being a broker. So that’s really important that you disclose that to the customers, if you’re gonna be broker or if you’re working with brokers, okay. ‘Cause remember something, even if you’re not the broker, if you’re the carrier, and your broker’s not complying with the law it’s gonna fall on you. So it’s just as important that as a carrier you understand what should be getting done legally to make sure you’re protected as well. So you wanna make sure that you’re definitely clearly stating that you are a broker. What we ended up doing was creating a whole another website, even created a whole another brand that was never associated with my old brand, so that there was no confusion at all about us being a broker. The new website had no pictures of trucks, no pictures of movers, every single page said we’re a broker, we’re a broker, we’re a broker, or as the old site because we were a moving company also there was confusion. So, it’s not enough to say, “Hey, on my interstate page I talk about being a broker,” I’m living proof that that’s not enough. You have to clearly make sure your customers know that you’re a broker. Number two, failing to obtain an interstate license prior to conducting business, you must have a broker license before you broker any moves. 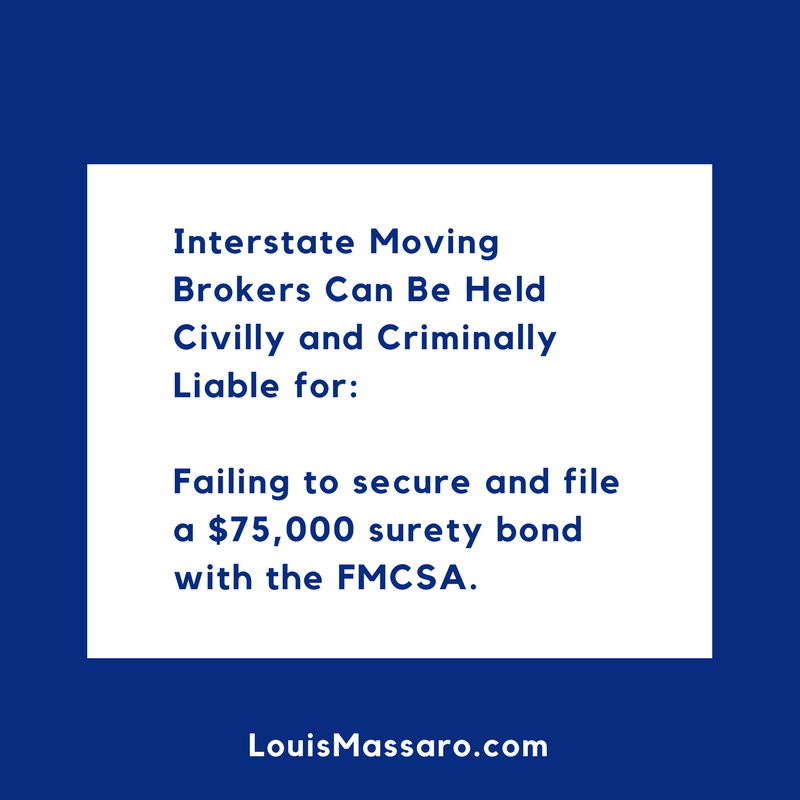 Failing to secure and file, a $75,000 surety bond with FMCSA, you have to get a surety bond at $75000, you don’t pay $75,000, but you must get the surety bond, so that you’re legal. Brokering a shipment to unlicensed motor carrier. You need to vet everybody that you do business with. As part of being a broker, that’s the most difficult part, you’re essentially… We spend a lot of time policing carriers, doing background checks, trying to figure out when somebody applied, were they a carrier that we at one point blackballed, and we didn’t let them in our company anymore that now has another company in someone else’s name and now they’re trying to reapply to be part of our network? You need to make sure that, A, they’re licensed and B, they’re gonna do a good job if you’re a broker. Failing to provide potential consumer shippers with a complete listing of all the motor carriers in your broker network. As part of being a broker, you must give every single customer a list of every carrier that’s in your network. Whether that’s electronically through email, whether you mailed it them, whether you give it to them, if you do an on-site estimate, you have to give them a list of every carrier that’s in your network. Failing to provide consumer shippers with the booklet rights and responsibilities when you move. This is whether you’re a broker or whether you’re a carrier, they need to get a copy of that. You could do that digitally as well. You could send them a PDF of that. 0Number seven, failing to provide a written estimate for services based upon the motor carriers published tariff. This is something that I know there’s a lot of people not doing, okay. As a broker, you have to know who you’re giving that move to at the time of booking it and you have to book it on their tariff. If you don’t know what a tariff is and you’re a broker, get this book. ‘Cause it’s a problem if you don’t know what a tariff is. If you’re an interstate carrier or a broker and you don’t know what a tariff is, you need to get this book. I’m not gonna explain it. I’ll put a link down below where you can get a copy of this. You have to book every job on that particular carrier’s tariff. For us, if we knew what was on the east coast in a certain area and a certain carrier was gonna be handling it, we would book it on their tariff using their rates, their information. Because as a broker, all you are is essentially a booking agent, I don’t know if that’s technically correct but you work for the carrier. The carrier doesn’t work for the broker. A lot of times, there’s a misconception there, thinking that the carrier works for the broker but really the broker’s booking moves for the carrier on the carrier’s tariff. Very important. Failing to maintain a master list of broker transactions. You have to keep a master list of everything from all your customers, all the deposits you took, all the financial transactions back and forth between you and the carriers. You have to have a list of that as well. Failing to have a properly signed 409 agreement with each license motor carrier in your network. 409 agreement is essentially a broker agreement between the carrier and the broker that has all of your terms… It’s a contract between a broker and a carrier. You must have one with every carrier that you work with. Again, these are things that brokers can be held civilly and criminally liable for. So these are very important. Let’s see, failing to provide consumer shippers with written notice of deposit, refund and cancellation policies. It needs to be very clear what your refund policy is, what your cancellation policy is, and it needs to be spelled out for ’em. For us, we had they could cancel up until seven days prior to the move. That needs to be in writing, in the terms and conditions when they book their move, very clearly. And number 11, conducting business evidencing a pattern of fraudulent estimates called low-balling. This is another reason where we got in trouble. We weren’t necessarily giving low-ball estimates, but we were giving moves to carriers that were raising the price on those moves. When they raised the price on those moves, our estimates looked like low-ball estimates. It wasn’t our intention. We weren’t purposely doing it, but it doesn’t matter. That’s why you have to really police everything that’s going on. We could sit all day and say, “We weren’t giving any low-ball estimates.” But if the price went up then estimate you gave was low, to the consumer, that’s a low-ball estimate. If there’s a pattern of that, again, these are reasons that as a broker, you could be held civilly and criminally liable. There’s a lot more to it in here about brokers. There’s everything you need to know about interstate moving in here. I’ll put a link below, where you guys can get a copy of this. I suggest that if you do any type of interstate moving, whether you’re a broker or a carrier, that you definitely look into this. Listen, you need to know the law. Period. You need to obey the law. I know, that sounds like common sense, but you need to go through this thing with a fine tooth comb. Highlight it, mark it, check off, what else? Circle what you need to do. And make sure you’re following every single guideline. It’s not a joke. You guys know my story, I literally had to plead guilty to fraud, felony charges from being a broker. It’s not a joke. If you’re gonna be a broker or if you’re gonna work with brokers, make sure things are getting done correctly. I can’t say it enough, I can’t stress it enough. If you haven’t seen the other video, it’s called “How I Almost Went to Prison for Running my Moving Business”. Go watch that, I explain the whole story. I hope this was helpful. Until I see you next week, go out there every single day and profit in your business and thrive in your life. I’ll see you later.